Memorial Wall Fountain Meditation Garden - Universal Landscape, Inc.
Memorial Wall Fountain Meditation Garden. This project was designed to provide a peaceful place, quiet and secluded for a meditative, prayer area. Built in remembrance for a lost loved one, the goals of the project were to provide visual privacy from the neighbors, which this feature is set in a front yard about 10′ in from a property line, in a shaded spot. There is a sentimental tree that was given by that same loved one years ago, and the 30’+ length Memorial wall provides privacy as it wraps from behind a bench facing that tree, to around the Ornamental Mimosa tree (pink blooms) which is out of view. 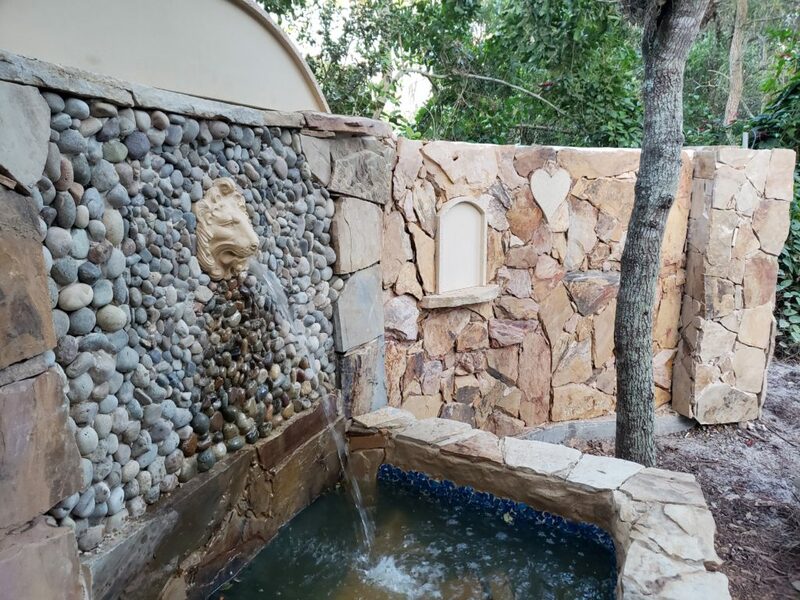 The sound of water was brought in through the fountain feature for sound privacy as well as a relaxing and tranquil sound which really helps the desired feel of the setting. The look of this Memorial wall fountain was to have a comfortable, rustic feel. Tennessee Crab Orchard Flagstone was used for the column end posts while Georgia Sunset Flagstone was used for the walls. Custom made by masons are the concrete accent pieces in the shape of tablets or windows in the wall with a crown feature up top (to be later engraved) and a heart adorning the wall just in view in the curve of the wall. A desired goal with this Memorial Wall Fountain was to make this feature look like it has been around for generations. The lion head was chosen for the accent piece for different reasons and the wall surrounding the lion head is a Mosaic of different size Mexican Beach Buff Pebbles, again framed on all sides with Tennessee Crab Orchard stone. Lighting was also a very important part of the design of this meditation garden feature and as other photos on our website will show, how it looks lit up at night. Blue Cobalt glass pieces were mortared into the pond for the majority of it with underwater lighting for a couple of reasons. 1. To help provide a more blue look to the water. 2nd, to help create a more reflective quality to the lighting at night, to help the light “bounce” more in an effort to better, softly light up the water feature without direct spot lights on it. Again, going for that softer, comfortable look, and with the motion of the water, the light softly ‘dances’ in a way against the mosaic. To view this feature at night, again, it will be posted in other photos as well as the finished photos of this project on our site. We hope you like !